I’ll always have a special place in my heart for Brendan Gleeson thanks to his role in Braveheart as Hamish. That was his first big movie, one of my favorites, and the Irish actor has been a mainstay ever since. Although, one could argue that he’s just now hitting his stride at the age of almost-60, getting role after role in heavy hitting pictures like The Guard, Albert Nobbs, Edge of Tomorrow, In the Heart of the Sea, and here in Calvary. Gleeson is a powerful actor, both in size & in presence, able to man-handle any role with brute force. But in this quiet drama, he was called upon to do a bit more, to show us another side of his talent. I won’t say he failed; I’ve never seen him fail at any character he’s attempted. The film though, perhaps that failed, at the very least struggling to match the intensity of a great actor, leaving him unsupported by both story & cast. 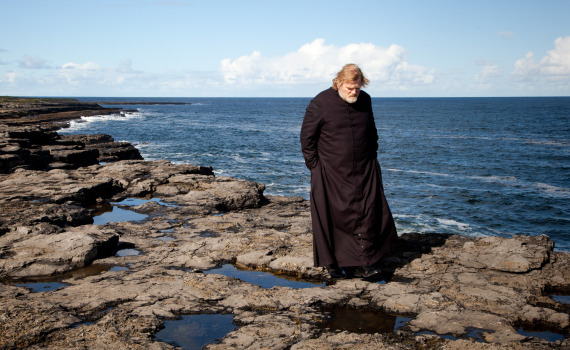 Father James, a priest in a small Irish seaside village, an ear to all. Well, an ear to all Catholics, which means almost everyone, including the man who, at the beginning of the film, tells Father James in confessional that he will kill the priest in one week’s time down on the beach. Quite a confession, and quite a burden for the busy Father to bear as he goes about the routine business of saving souls. There aren’t many souls in the town actually, a place where everyone knows everyone, but one of them plans to become a murderer on Sunday morning. That doesn’t stop Father James from meeting with the locals and helping them all with their problems: Veronica & Jack Brennan the troubled married couple, Simon her African lover, Dr. Frank the atheist, Michael the rich man, Milo the simpleton, Inspector Stanton the gay policeman. Everyone has issues, everyone shares them with their priest, or will for one more week. I found Calvary to be too many movies all wrapped into one. It had a very serious mood, a darkness that I enjoyed and in which Gleeson shone. But it also had an unbelievable caricature feel, a goofy cast of characters that seemed straight from theatre. That’s fine, I don’t mind that, but not paired with a strong leading man whose scenes give the film a deep & suspenseful edge that’s immediately shattered when others walk into the shot. The added storyline of he & his estranged daughter was enough to deflect attention from the impending doom of murder, I didn’t need a who’s-gonna-do-it plot twist; that just took away from the important parts of the story. Gleeson was excellent, Kelly Reilly was interesting, but I didn’t care about anyone else, and anyway they were pointless. McDonagh needed to step away, do some paring down, and deliver a compact product; what we got was anything but.